The Nigerian film industry (Nollywood) has predominantly been presented as a masculine world. This is not unconnected to the fact that most of the players and central figures in the history and growth of the industry are masculine. However, female entrepreneurship has marked the industry right from the early stages of its existence. Like their male counterparts, female entrepreneurs have, through exceptional entrepreneurial techniques, provided actionable solutions to some of the production and distribution crises which the industry has witnessed. 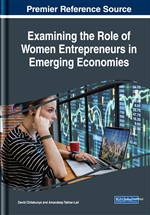 Using empirical understandings, this chapter critically explores female entrepreneurship in the sector. It provides a micro-level perspective of socio-economic challenges faced by women entrepreneurs in the Nollywood film industry and their future prospects. The chapter begins by exploring entrepreneurship in Nigeria's economy before delving into the prospects and challenges of women entrepreneurship in the Nollywood industry. The last decades have witnessed a remarkable increase in the number of female entrepreneurs in Nigeria. From the agricultural sector through the manufacturing industries to the tertiary sector, there has been an expanding trend in Nigerian women’s entrepreneurial initiatives. Research actually indicates that Nigerian women of all ages have these last years, non-hesitantly challenged or shattered gender stereotypes and succeeded to make a name in the Nigerian or international business landscape. As entrepreneurs, they have been making incredible strides in their personal and professional lives, creating new spaces for women social and economic mobility. According to the Nigerian Bureau of Statistics (2016) and the BBC (2017), 30 to 40 percent of the registered entrepreneurial businesses in Nigeria are owned by women. In the same line of argument, the results of a survey carried out by Global Entrepreneurship Monitor in the year 2016 revealed that 41 percent of business startups in Nigeria are run by women (Komolafe 2016). A study carried out a year earlier by No Ceilings (an initiative of the Bill, Hilary & Shelton Foundation) similarly revealed that 41% of women in Nigeria are entrepreneurs, making Nigeria the country with the highest number of female entrepreneurs in the world. This study equally revealed that a woman in Nigeria is four times as likely to be an entrepreneur than a woman in the U.S. (Woman 2015). It is assumed that the above statistics and indexes illustrating Nigerian women entrepreneurial activities must have increased over the years. It is equally sufficiently observable that the country presently numbers a host of prominent female entrepreneurs in virtually all sectors, including the ones hitherto regarded as male preserve. Some of the prominent Nigerian female entrepreneurs include Joycee Awojoodu (founder of the ORIKI Group), Akudo Anyanwu-Ikemba (founder of Friends of the Global Fund Africa), Adiat Disu (founder of adiree.com), Arese Ugwu (founder of Smart Money Africa), Adenike Ogunlesi (founder of Nigeria’s leading children wear brand Ruff n Tumble) and Bunmi Laditan (creator of honesttodler.com) among others. One sector which has recently witnessed a dramatic increase of female entrepreneurs has been the Nollywood film industry. The likes of Amaka Igwe, Helen Ukpabio, Uduak Isong, Stephanie Okereke, Emem Isong and Peace Anyiam-Osigwe (just to name a few) have, in recent times, seriously been involved in the complex process of transforming the economy of the Nollywood industry and pushing it (the industry) beyond its limits. These female entrepreneurs have deployed varied business strategies and have progressively gained pronounced social visibility. As put by Jedlowski (2016), they have tremendously contributed to “the construction of the collective imagination of women’s social and economic success”. However, in spite of their foundational role in the growth and overall success of the industry, the position of many women entrepreneurs in Nollywood generally leaves much to be desired. In effect, female entrepreneurship in the industry seems persistently to be threatened by a number of both social and economic factors, most of which are gender-related. Like all the other major film industries of the world, Nollywood has always been a masculine world, with most of the producers, directors, screenwriters, distributors and investors in the industry being male. The persistent patriarchal structures and strictures prevailing in the Nigerian social fabric have made many social arbiters and opinion molders to regard female entrepreneurship in Nollywood with concern. This and many other subtle factors tend to limit women entrepreneurial activities within the industry. Using a mixed-method approach constituted of critical observations and secondary sources, this book chapter opts to provide a micro-level perspective of socio-economic challenges faced by women entrepreneurs in the Nollywood film industry and their future prospects. The chapter begins by exploring entrepreneurship in Nigeria’s economy before delving into the prospects and challenges of women entrepreneurship in the Nollywood industry.